The G programming language provides the next generation programming alternative allowing users to develop interactive parallel programs whether they have extensive programming experience or not. It's graphical syntax and constructs allow researchers, teachers, students and even children to program complex devices and systems in minutes rather than hours, days or even months. 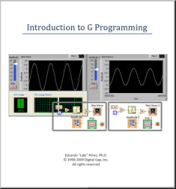 This book was written by one of the original LabVIEW/G development team members to help the user learn the G programming syntax and begin developing G programs quickly and easily. Chapter 1 is an introductory tutorial providing a reference for beginners and seasoned programmers alike. Subsequent chapters provide more details on the G syntax building up to the development of parallel programs that run on multicore platforms.